Each year I go into the 8th-grade classrooms for 3 days to talk about mindset, goals setting, and future planning. 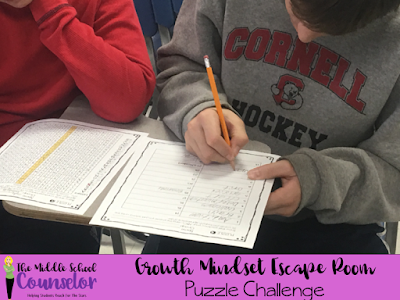 This year I wanted to throw a new twist on Growth Mindset, so I decided to challenge all the classes with an Escape Room. The evil Dr. 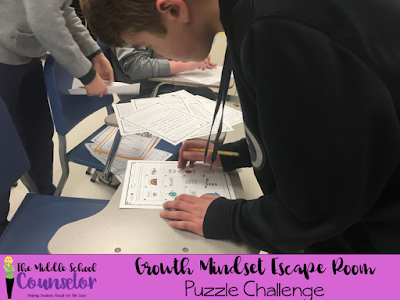 Dread has broken into the school and is trying to turn the students' brains to mush, but the only way to combat him is to have a growth mindset and solve all his puzzles. I had the students break into teams and then gave each team a set of challenges to work through. They had 30 minutes to look at the puzzles, decide what they needed to do to solve them, who would be responsible for working on each puzzle, how to find the ciphers that were hidden around the room, and how they would use their time to use the cipher when another team wasn't. (I had only one of each of the 5 different ciphers, so all the teams had to share.) As they solved the puzzles, they were able to collect keys that held the code to escape the room. Not all the groups were able to escape. In fact it was about 1/2 that were successful. 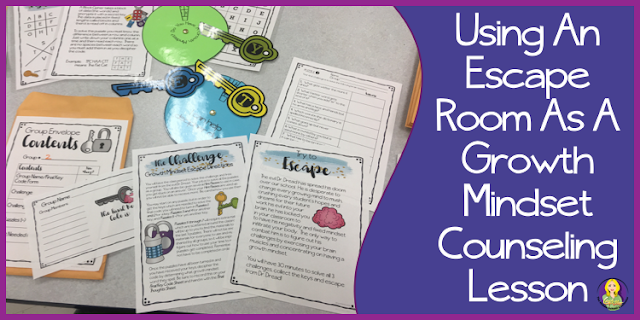 Word got out and with each class the students were more eager to beat the last winning time to solve the escape. I enjoyed just watching them. The Escape Room was teaching the students to work together, to use time management skills, to compete while being collaborative, and to grow their mindset. Every student was engaged, and it didn't matter if it was the shyest kid, the one that always seems to be in trouble, or the classroom leader, they all had jobs to do. I did give each group "I Need A Hint" passes they could turn in for help. It was interesting to see how they decided to use them and how they would come together to help their peers who were in need of help. 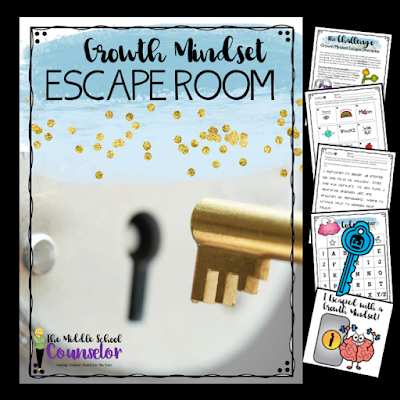 Why would I have you do an escape room if I wanted to talk about growth mindset? Were any of the challenges too hard? Were they too easy? Why do we need a growth mindset for high school? How can you take what we experienced yesterday (in the escape room) and apply it to high school and future planning? They all told me they had fun ( and were disappointed I didn't have another one for them to do today) and they were able to make the connection that they needed the growth mindset to complete the challenges. In terms of applying what they did to high school, a school should be fun. They need to take courses that are neither too hard or too easy. The same holds true with goals. Having a growth mindset will help them obtain their goals and keep learning fun because new challenges are waiting. I do believe they understood what I wanted them to walk away knowing. I can't wait to do my next Escape Room! 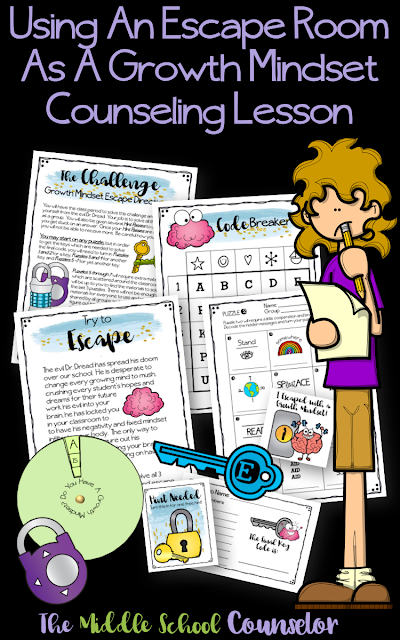 If you would like your own copy of this Escape Room, you can find it in my TpT store here.